Navigating in a new country or region can be daunting, especially when your company and product or service might not have the cache it has in your home market. Even with a strong corporate vision, building brand recognition takes time and effort. And with the right knowledge it can be a less bumpy road to success. Market research offers key insights into an overseas terrain. Begin collecting critical data on your target market to help you with developing your communications approach: its overall potential, current competition, brand and product perception, and appropriate marketing channels. Find your bearings from competitive analyses, perception audits and surveys. Early due diligence from research is like having a compass. It can quell your doubts, help you plan, and set you on the road to success. Every market is different so using the same marketing and communications blueprint, even if successful in your home market, will not work. Your new customers will likely not have the same buying needs and values. Ask, will your current branding and messages resonate with your new audiences? 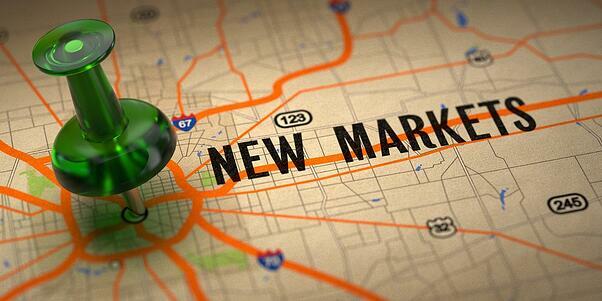 Come to every new market with a new game plan. Part of market research means figuring out what’s been successful in your line of business in your new market in terms of channels, strategies, and marketing mix. This will help you figure out where to put your resources, staff and budgeting. Marketing strategies that have buy-in and are supported by higher level executives are more successful. It’s important that they are involved in making sure that the corporate vision and messages are consistent and elevated when reaching new audiences. Foray into a new market may also require a more resource-intensive approach, and you don’t want to run into barriers from management while executing on marketing efforts. So, it’s important for marketers to present a solid marketing plan to executives early on and getting buy-in. The plan must include clear goals, strategies, budgets and most importantly, outline how these programs will help the bottom line. Sometimes, bringing in external support is needed to aid in larger marketing efforts, especially if the local team might be lacking in internal resources. Finding partners with the right on-the-ground expertise can help you navigate the maze of business and cultural nuances – and bridge the gap if you can find a partner that understands your local culture and be able to translate and communicate important messages in a way that reaches your new audiences that is meaningful to both of you. Public relations is a key strategic element in a larger marketing and communications program. Publicity can put your company on the map. The media is essential to building your company’s image and visibility. Utilize key media relationships and influencers to generate buzz and third-party validation for your new business endeavor. Localize your top-line messages and content. Also, look into events, content generation, social media, and other relevant activities to further raise your company’s profile. Read timely tips for PR and Inbound Marketing.